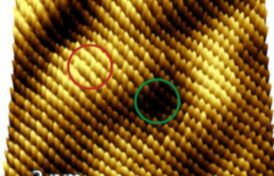 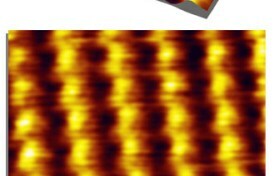 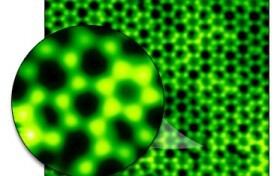 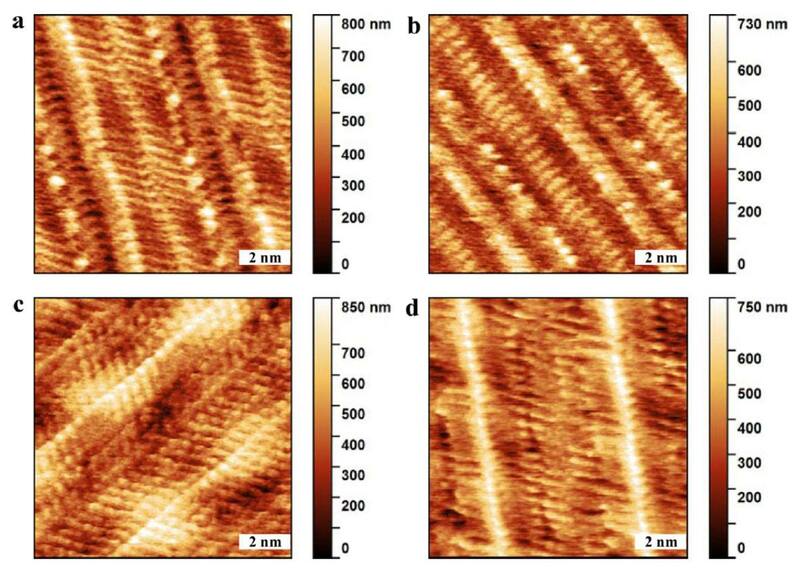 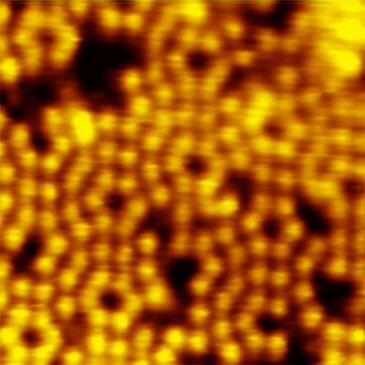 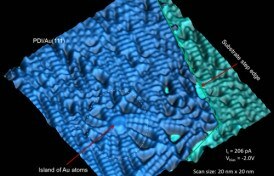 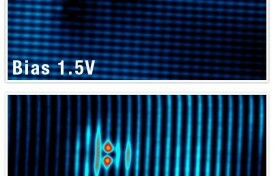 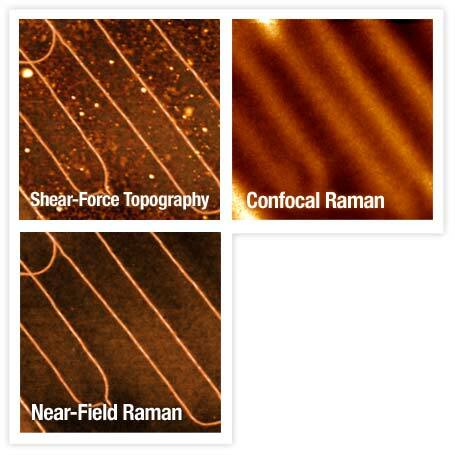 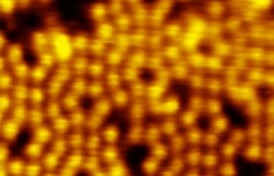 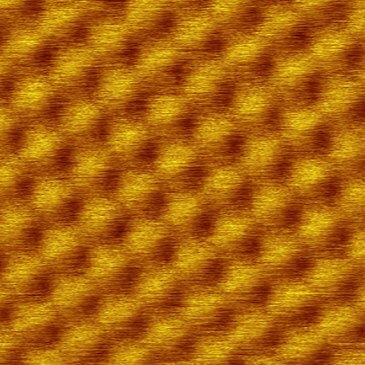 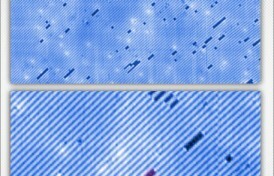 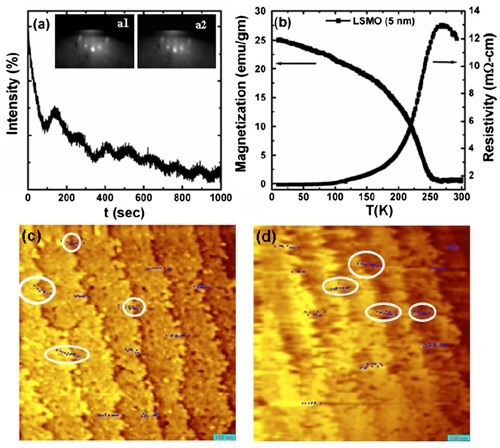 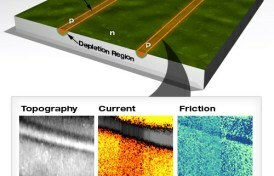 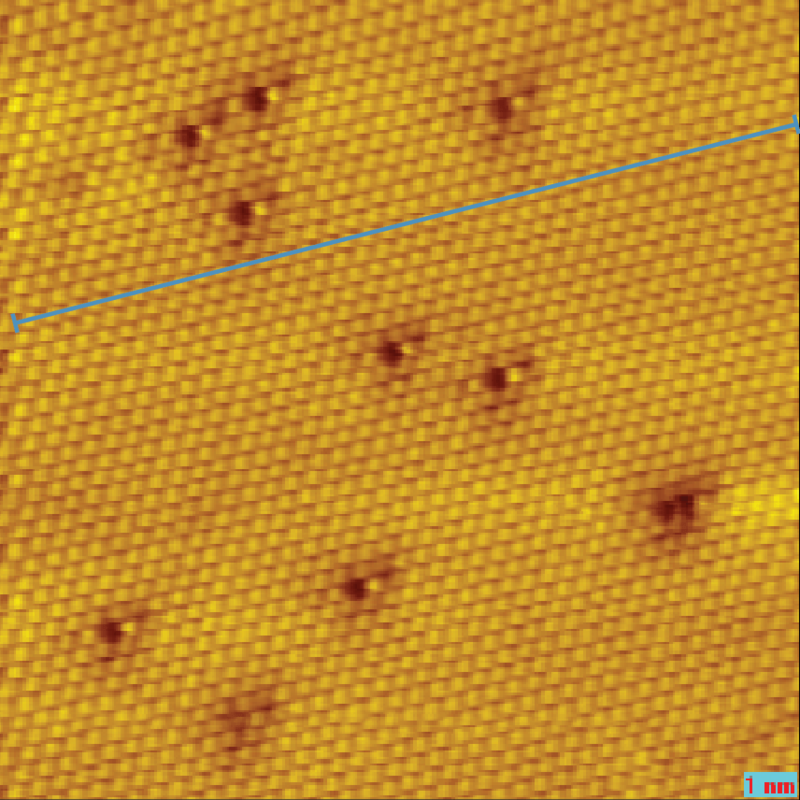 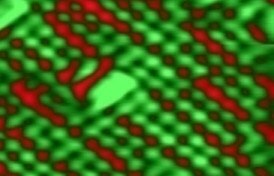 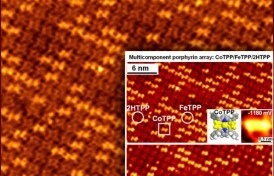 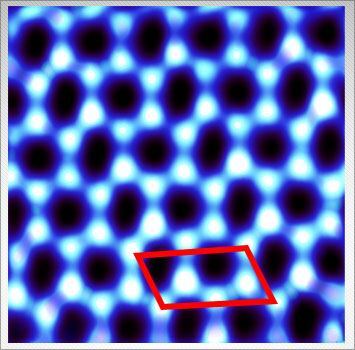 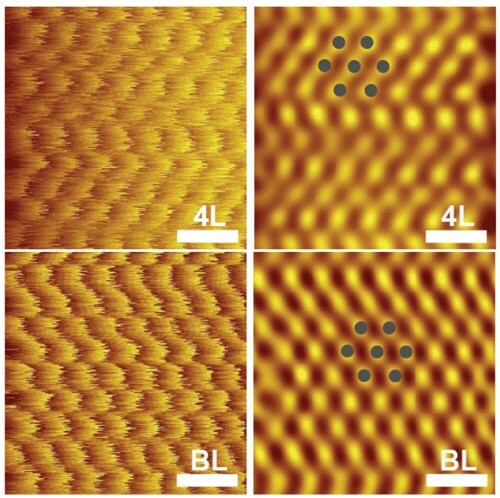 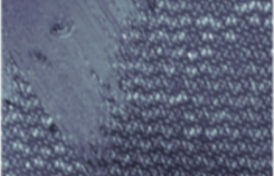 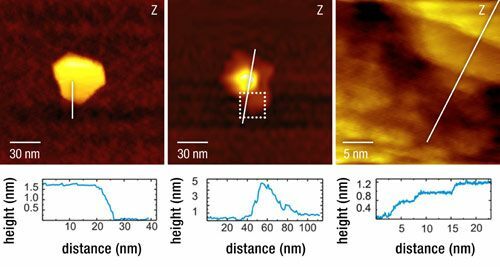 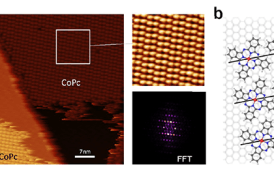 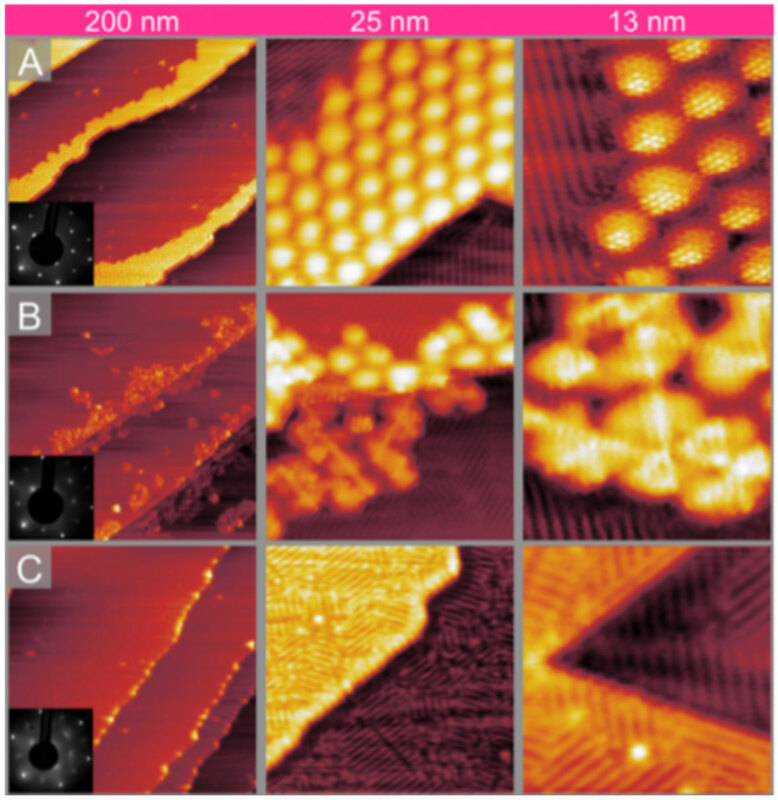 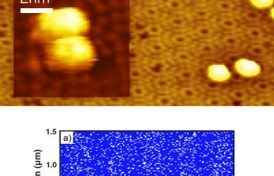 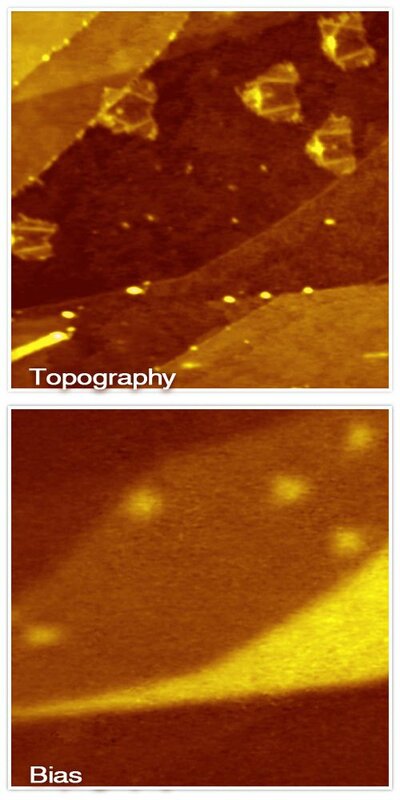 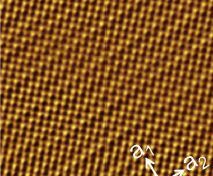 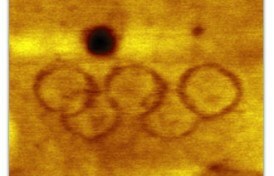 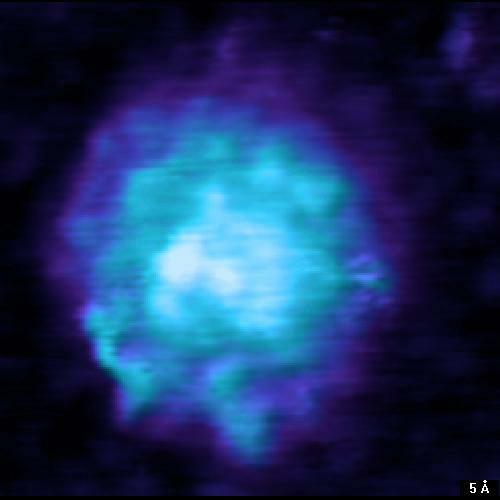 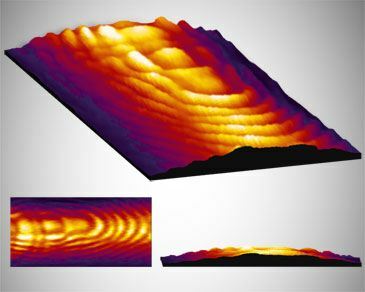 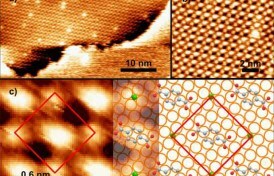 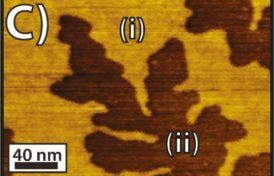 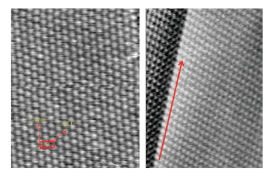 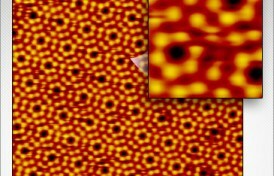 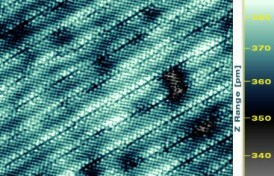 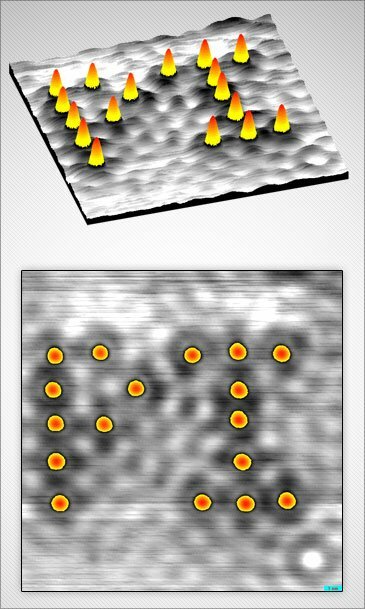 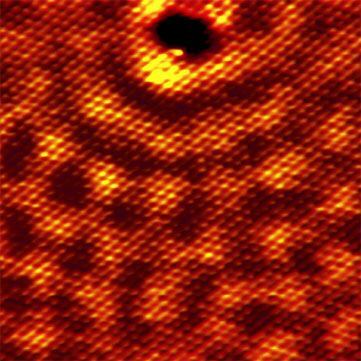 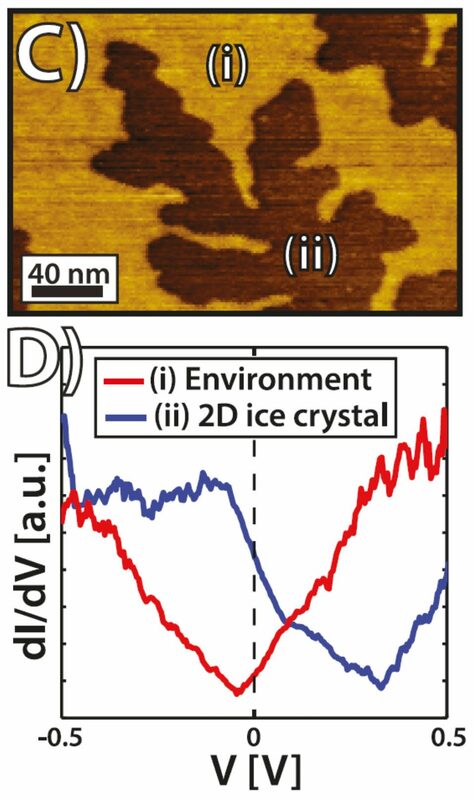 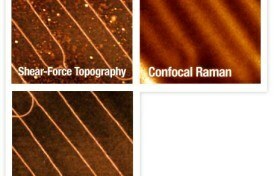 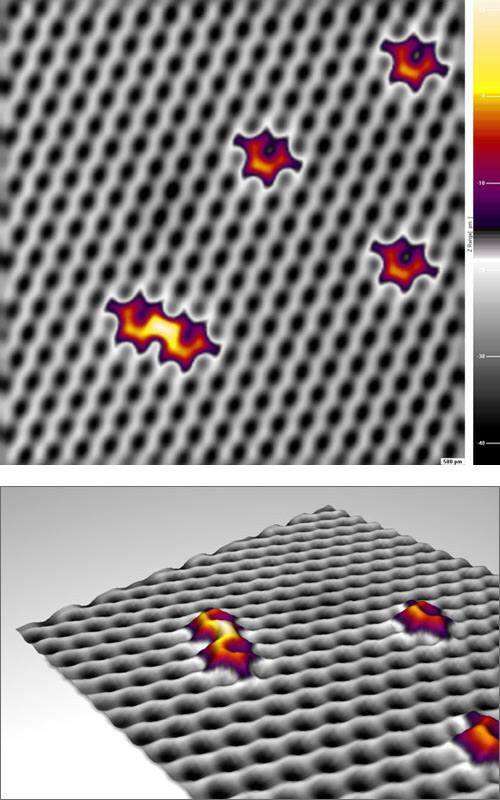 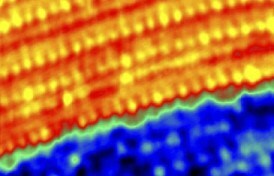 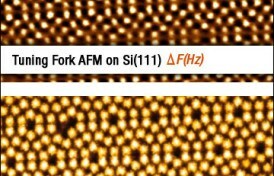 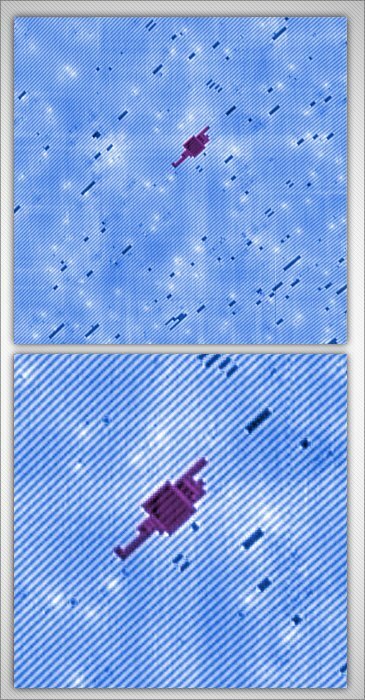 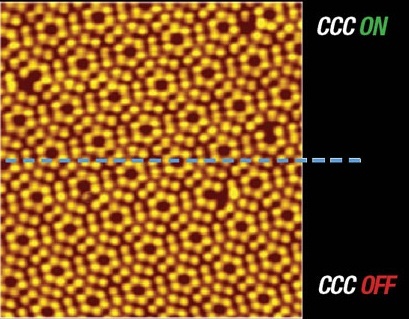 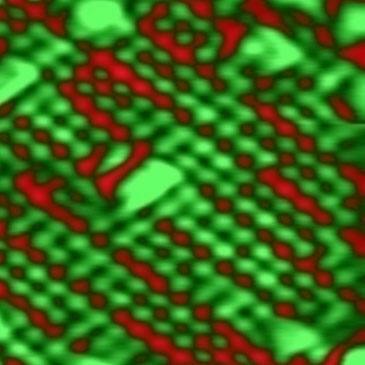 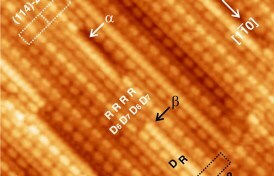 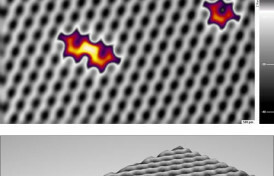 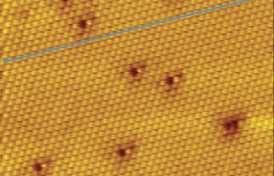 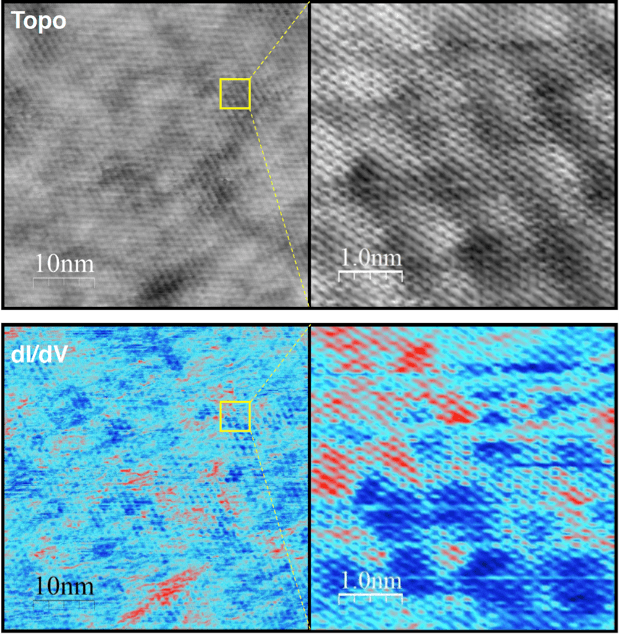 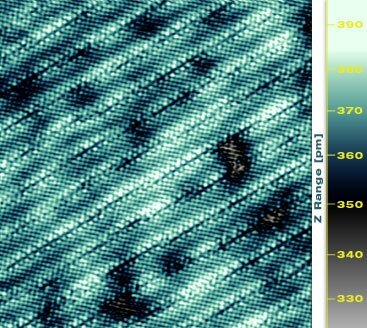 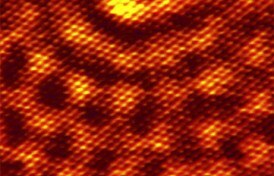 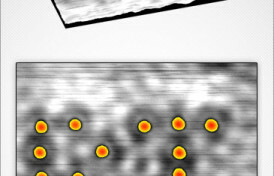 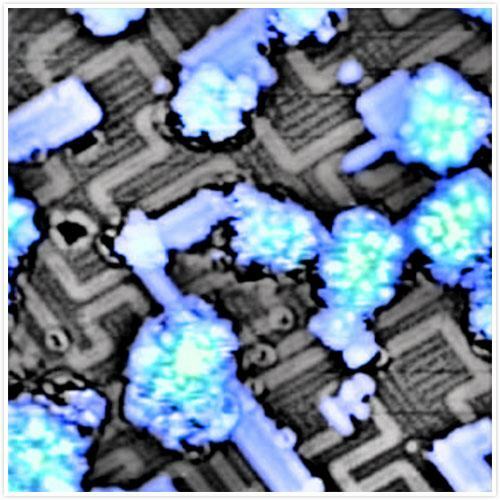 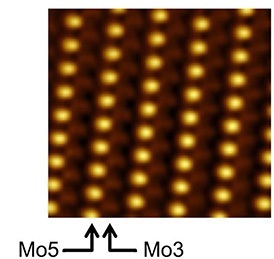 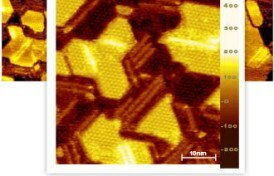 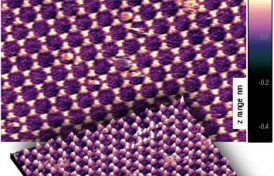 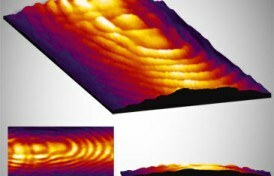 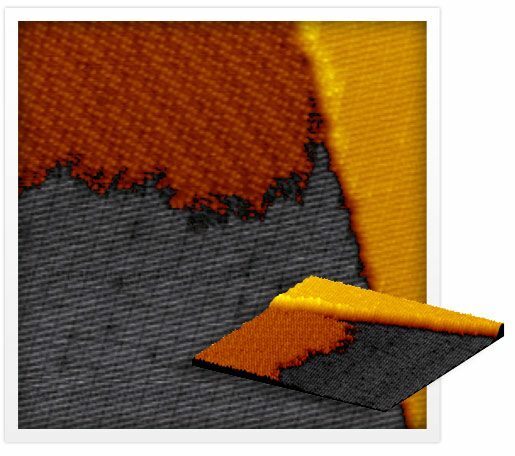 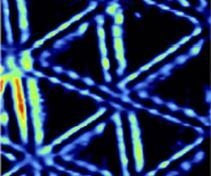 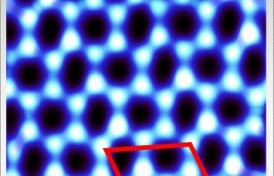 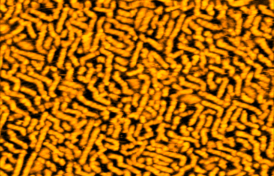 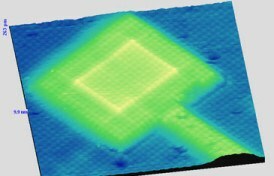 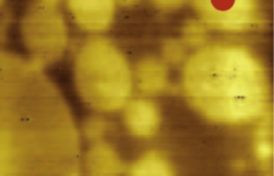 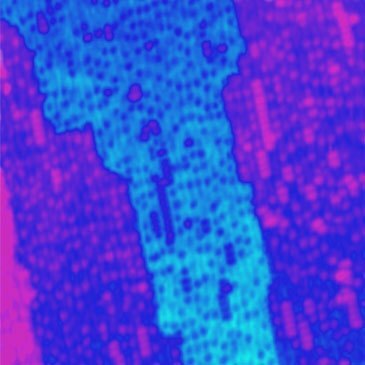 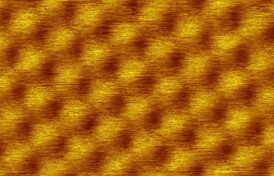 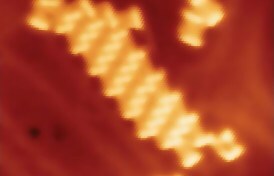 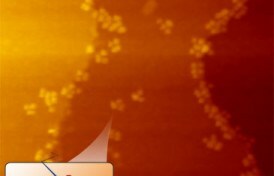 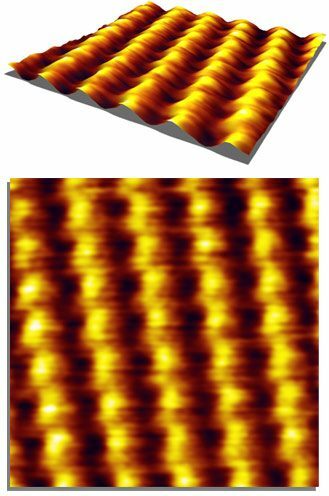 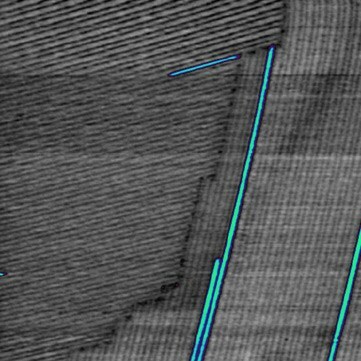 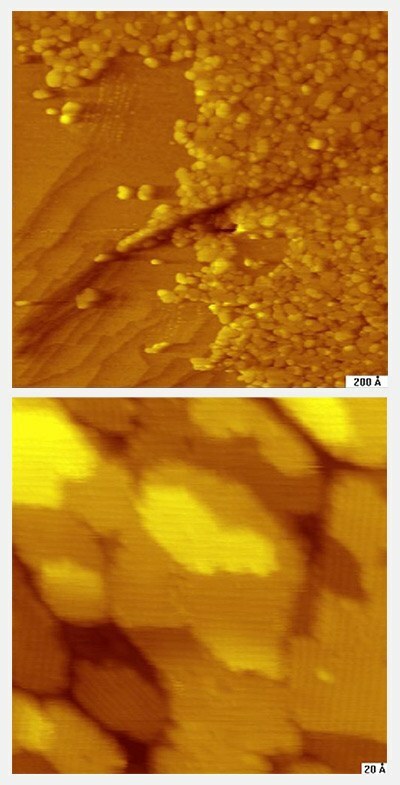 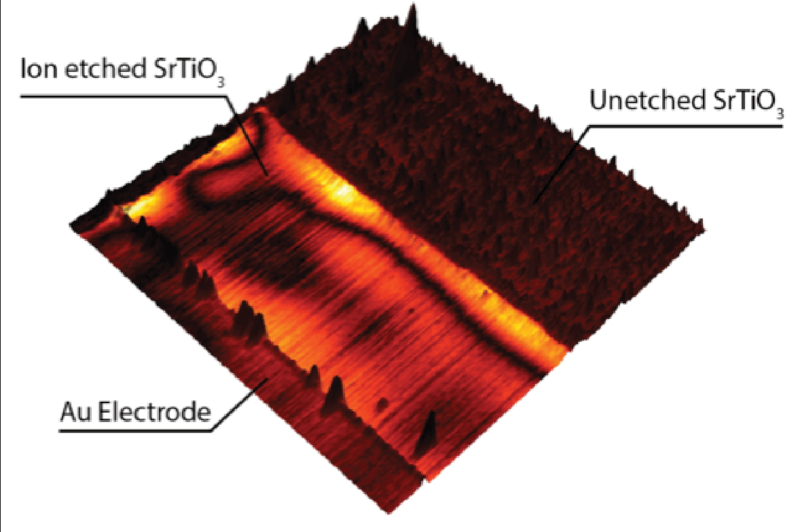 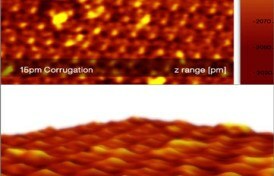 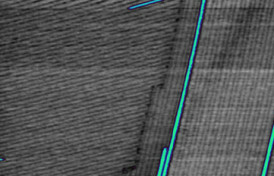 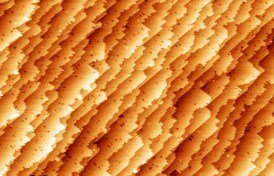 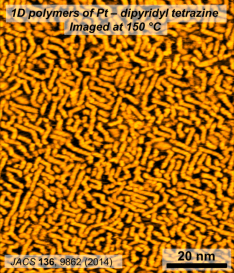 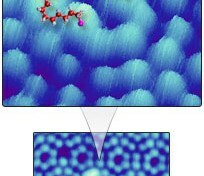 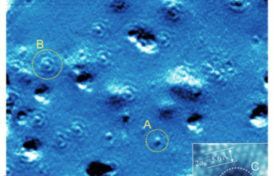 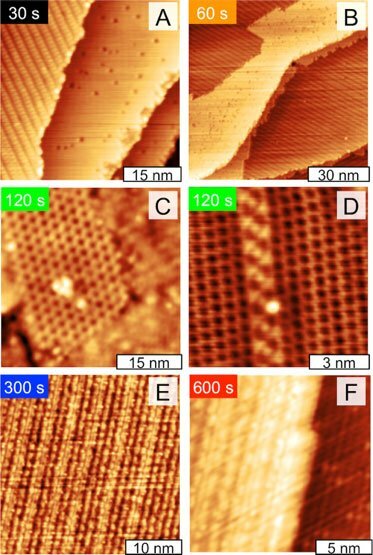 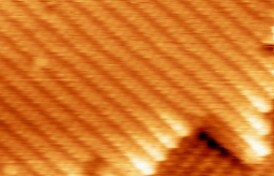 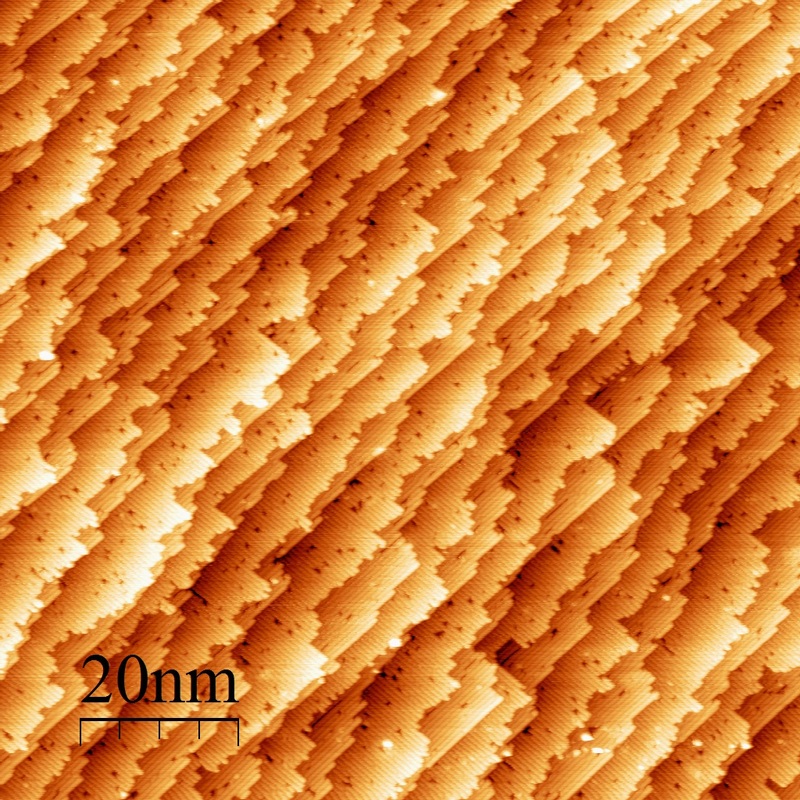 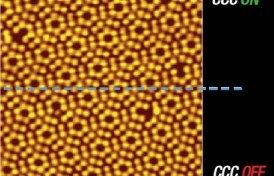 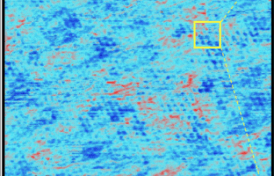 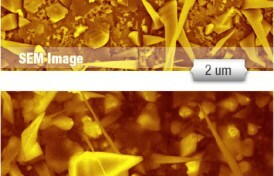 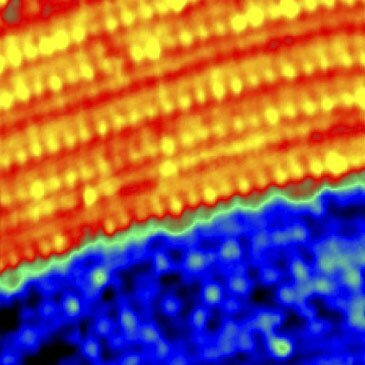 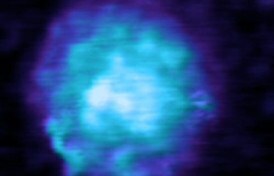 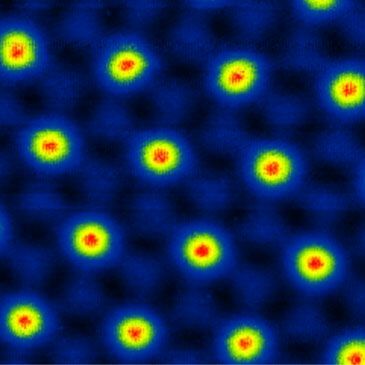 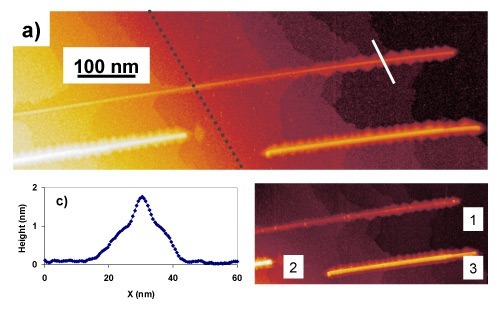 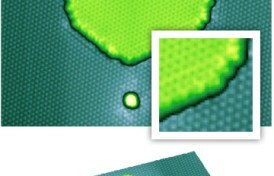 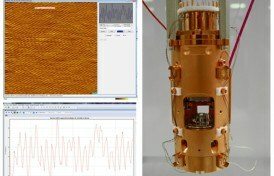 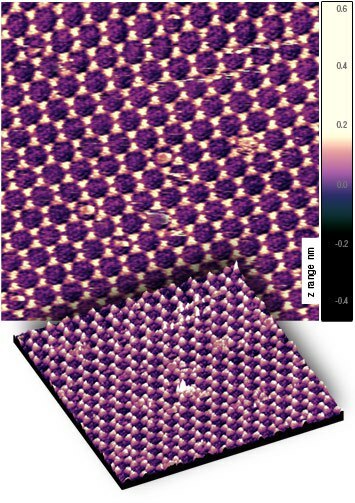 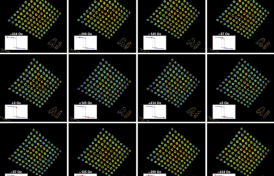 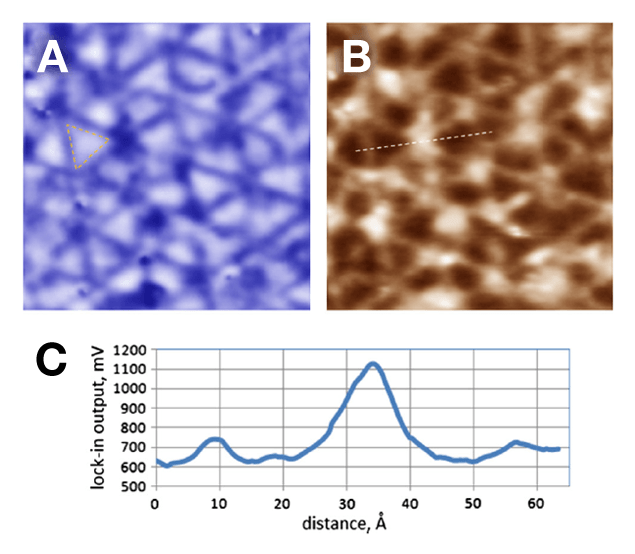 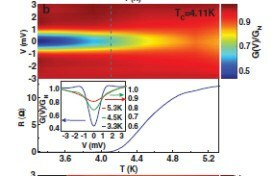 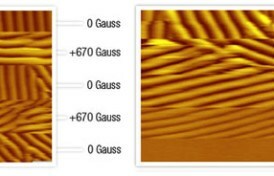 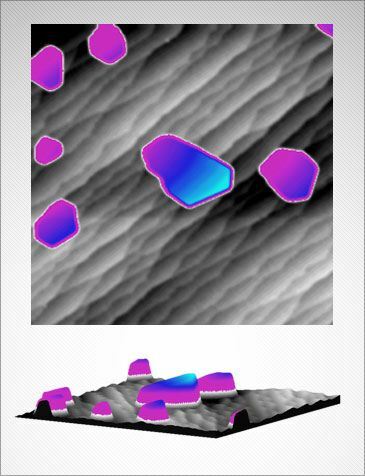 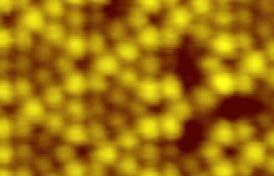 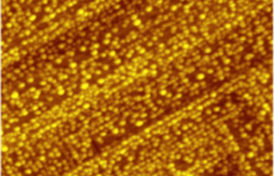 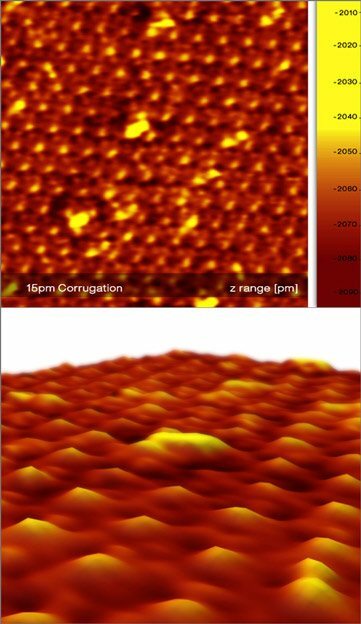 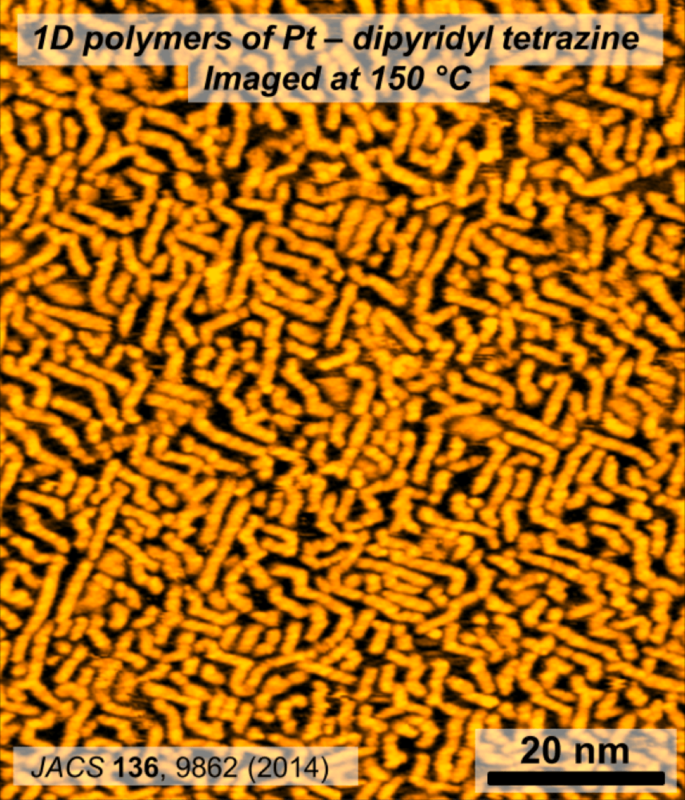 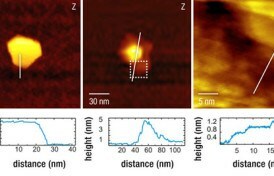 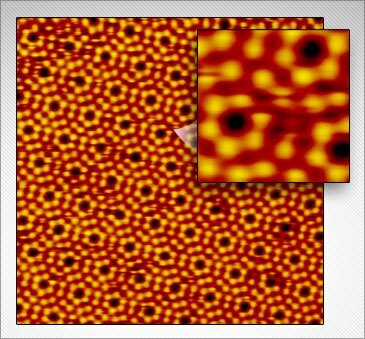 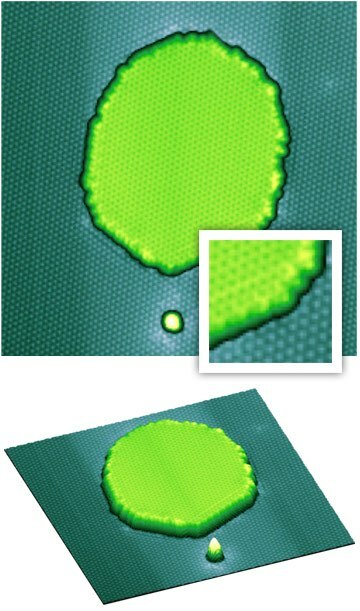 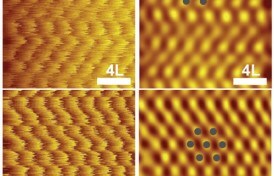 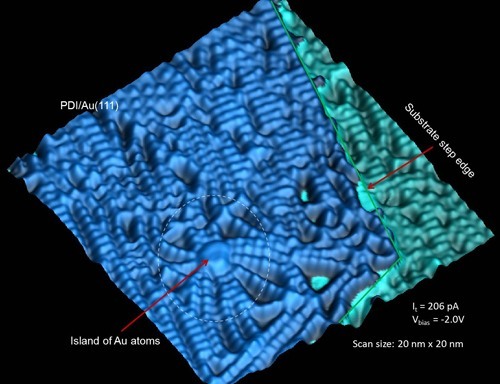 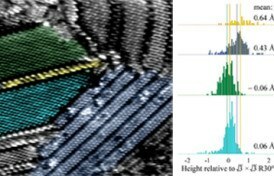 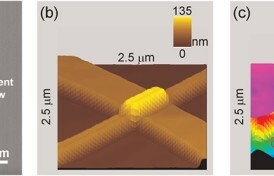 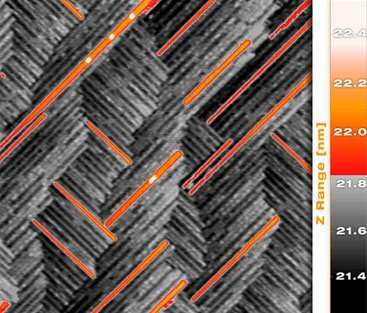 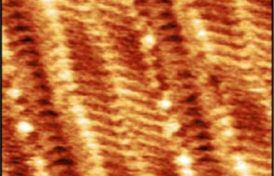 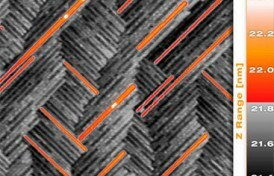 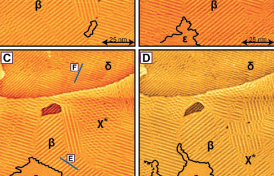 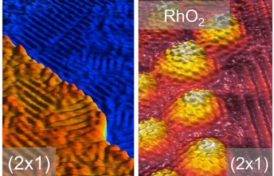 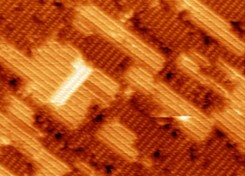 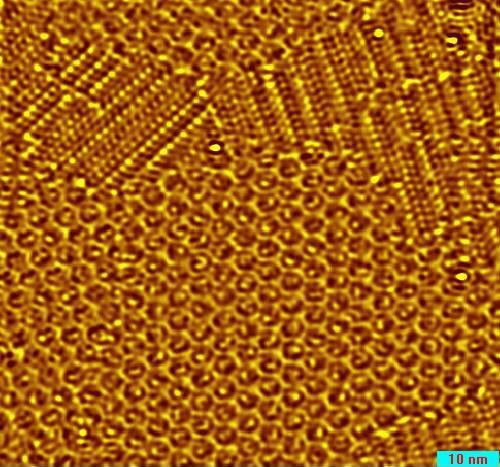 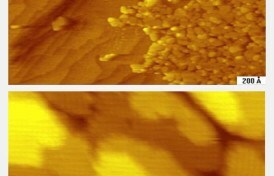 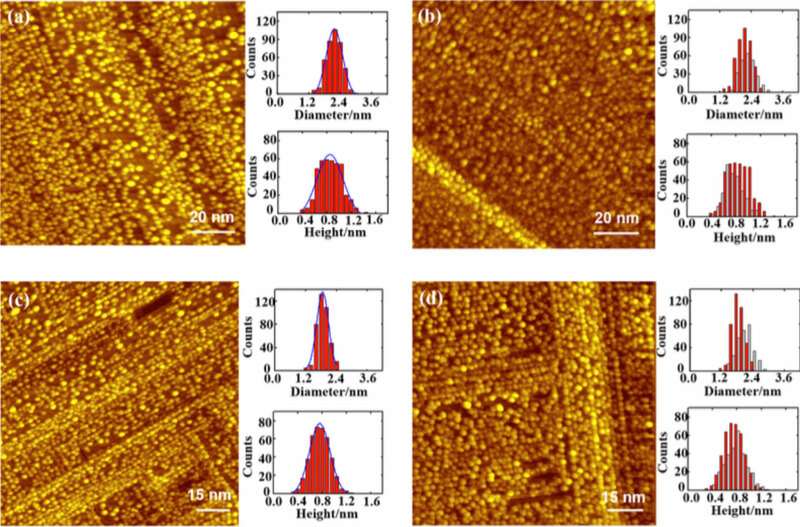 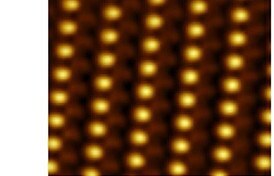 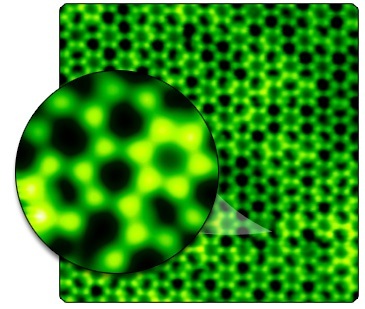 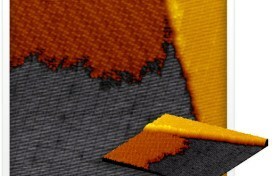 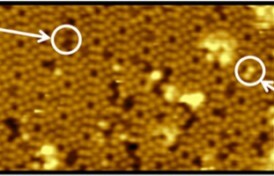 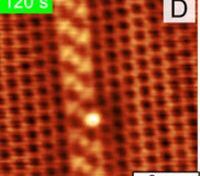 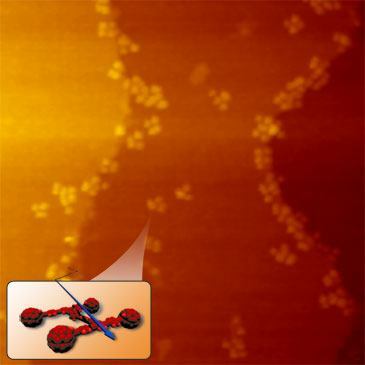 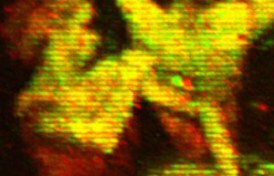 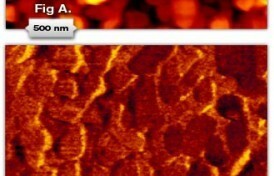 This image, recorded with molecular resolution at 150 °C, provides direct evidence for the stability of the metal-organic chains at high temperature on the Au(100) surface. 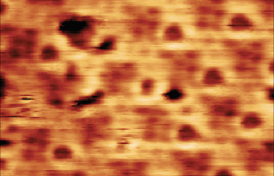 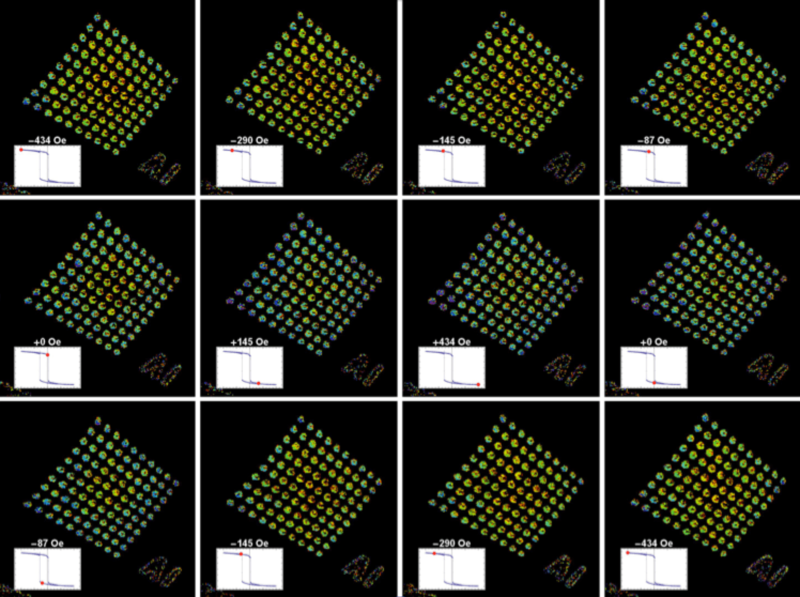 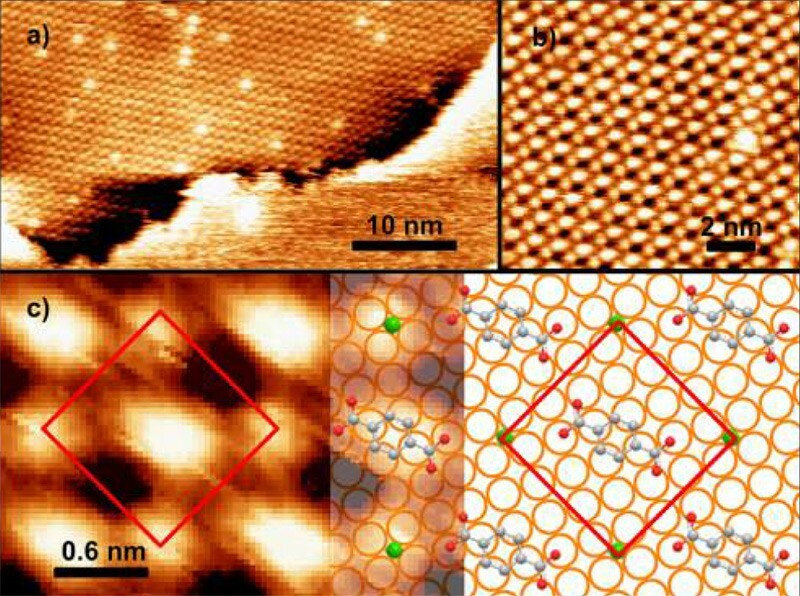 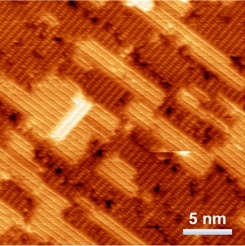 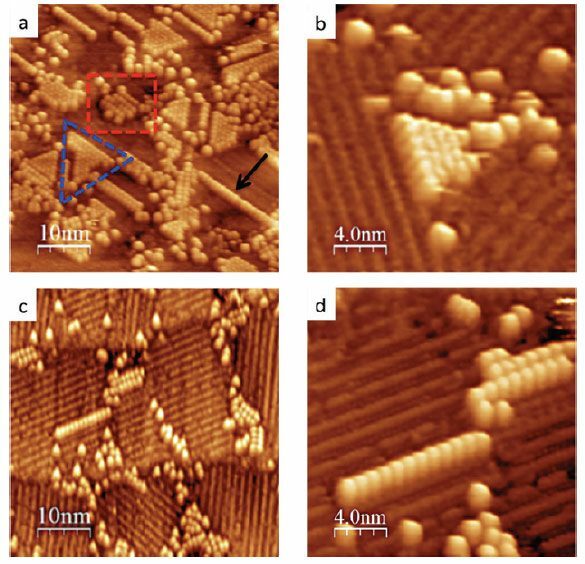 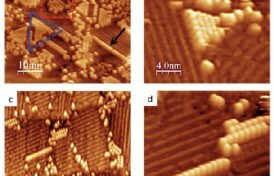 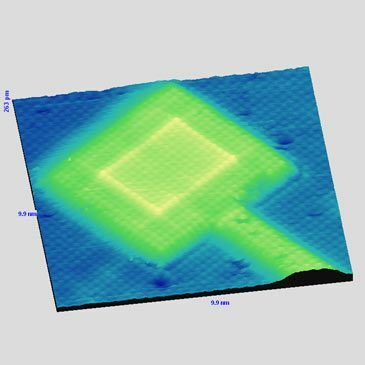 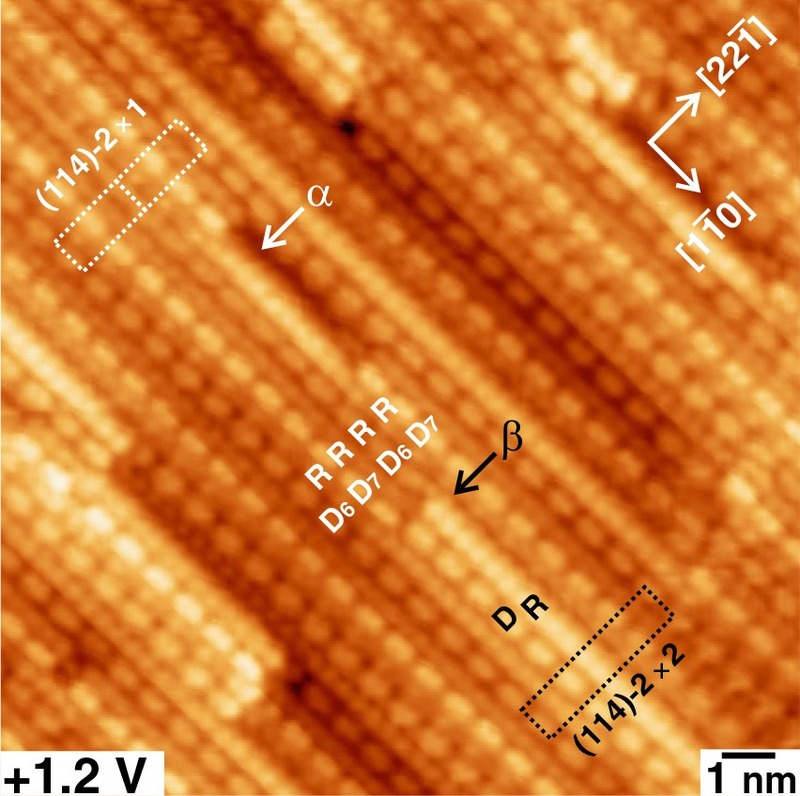 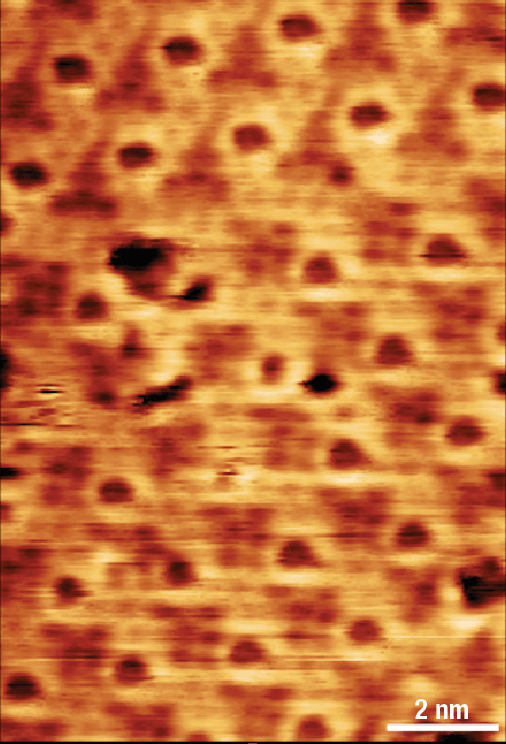 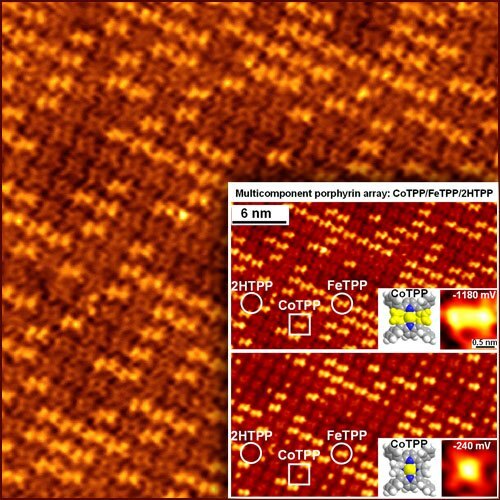 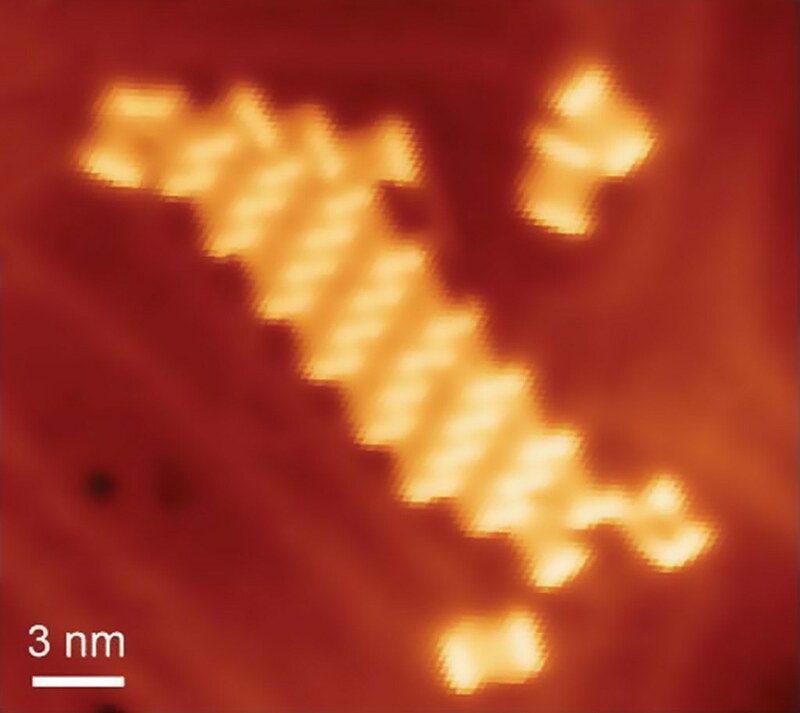 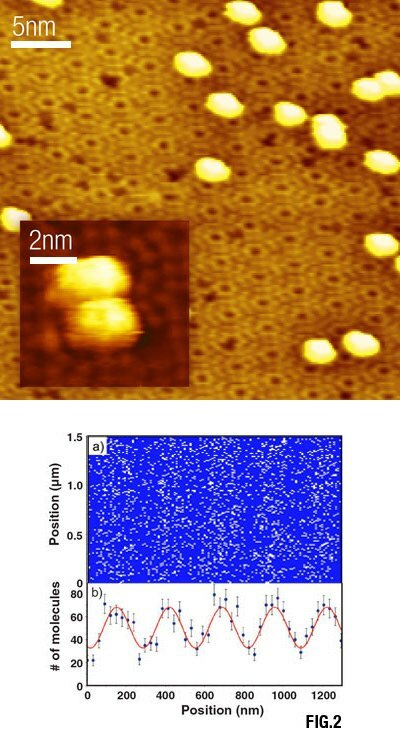 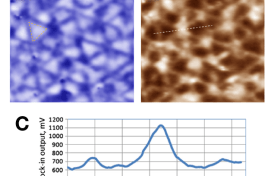 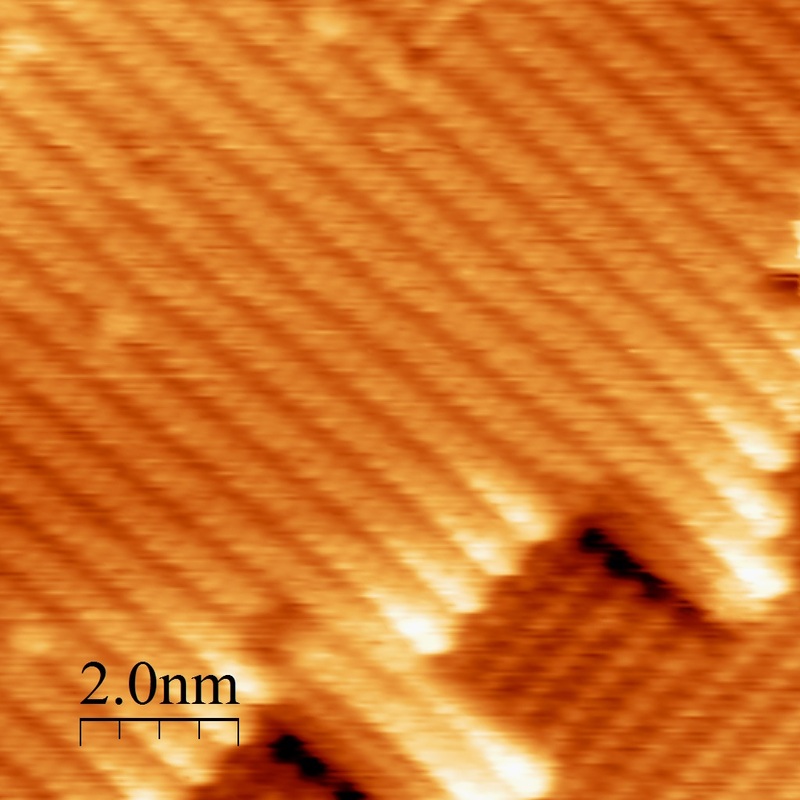 Elevated-temperature STM image collected with the sample held at 425 K showing platinum(II) dipyridyltetrazine 1D chains on the reconstructed Au(100) surface. 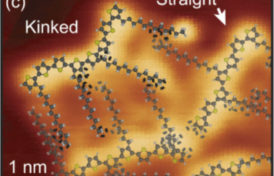 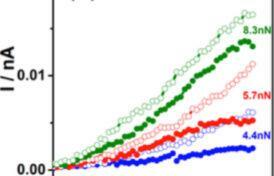 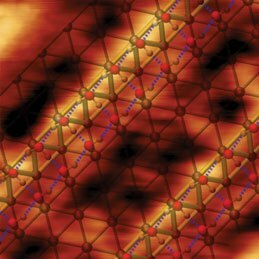 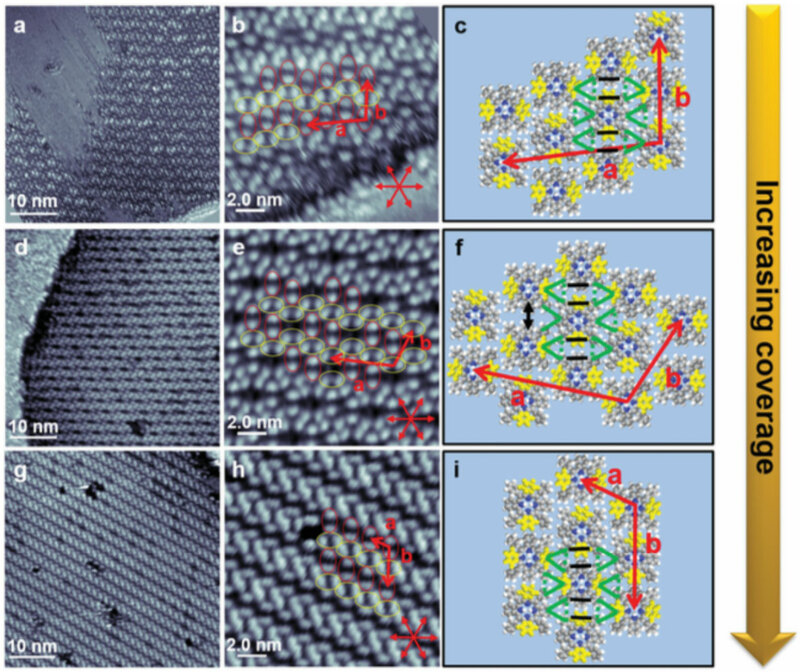 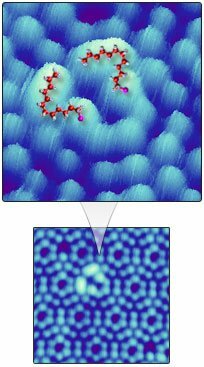 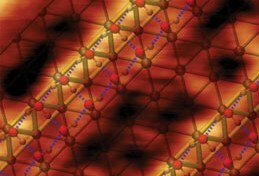 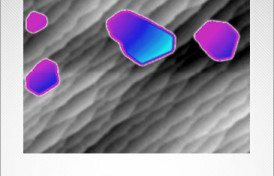 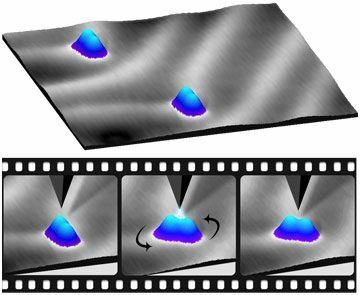 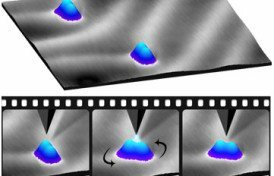 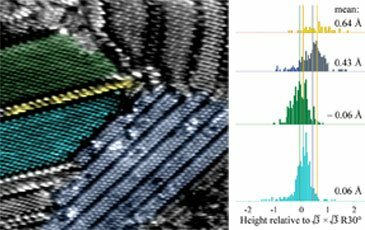 The formation and stabilization of well-defined transition-metal single sites at surfaces may open new routes to achieve higher selectivity in heterogeneous catalysts. 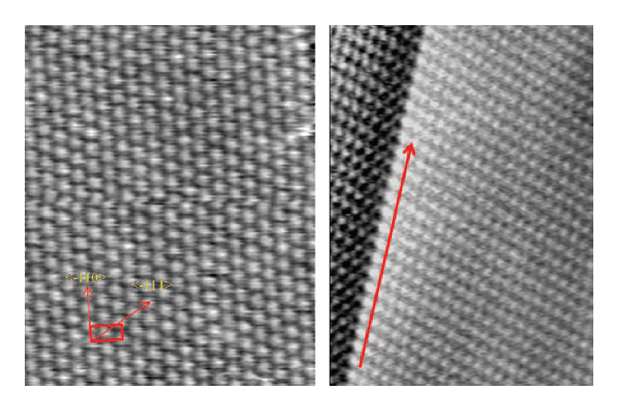 Organic ligand coordination to produce a well-defined oxidation state in weakly reducing metal sites at surfaces, desirable for selective catalysis, has not been achieved. 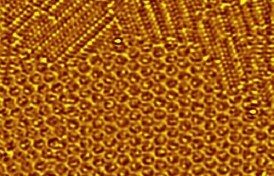 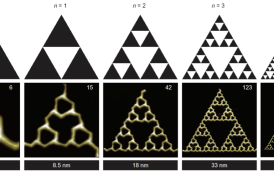 Here, we address this using metallic platinum interacting with a dipyridyl tetrazine ligand on a single crystal gold surface. 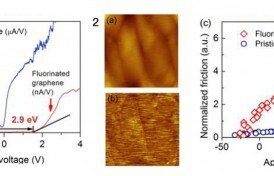 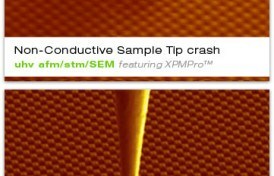 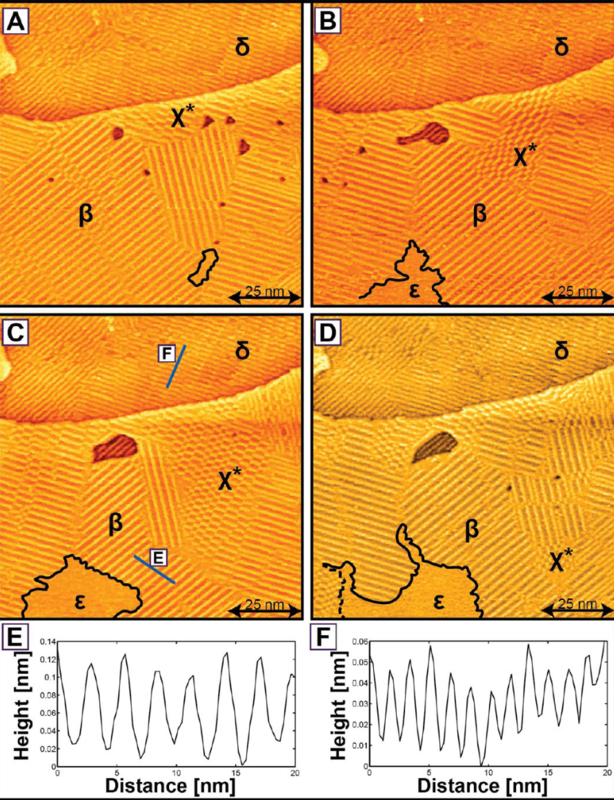 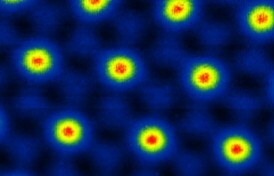 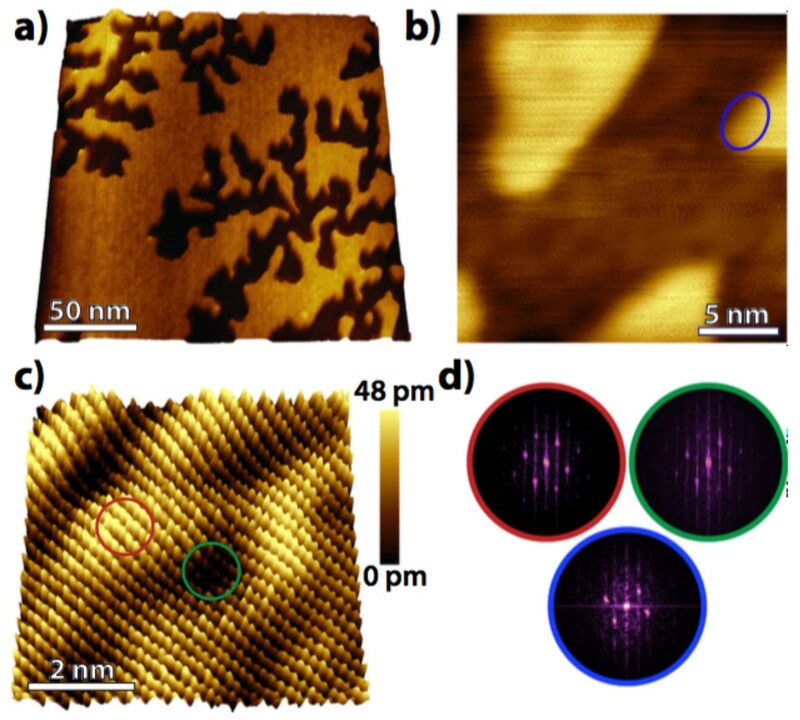 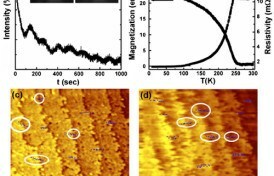 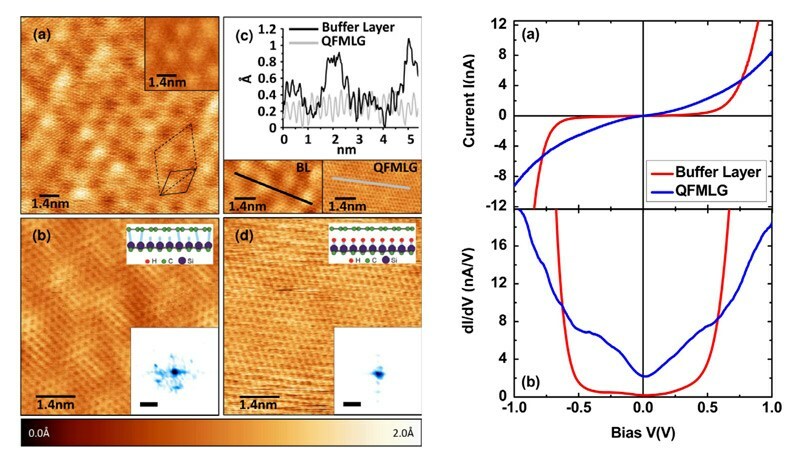 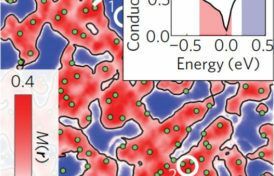 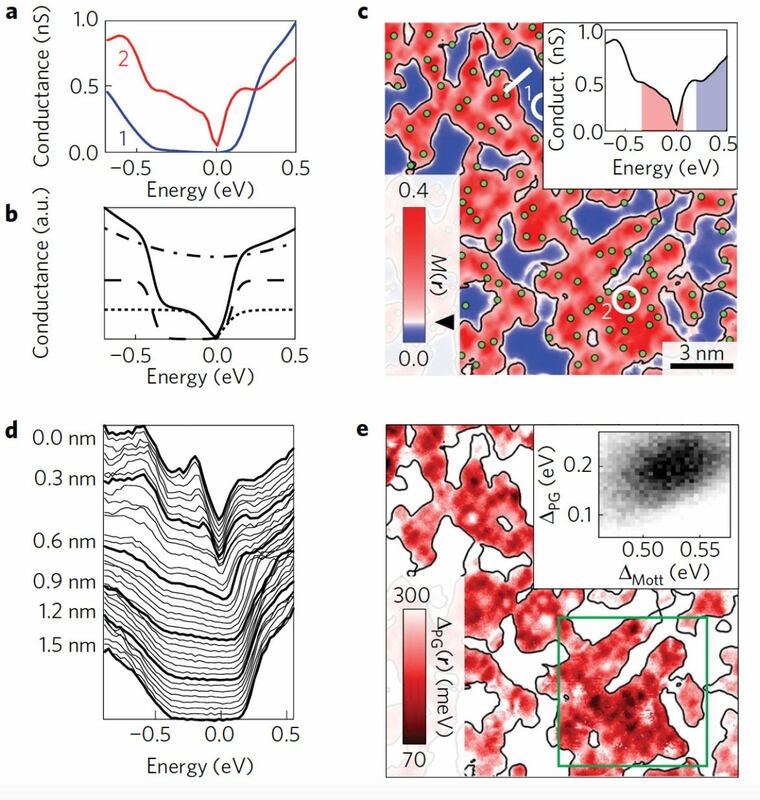 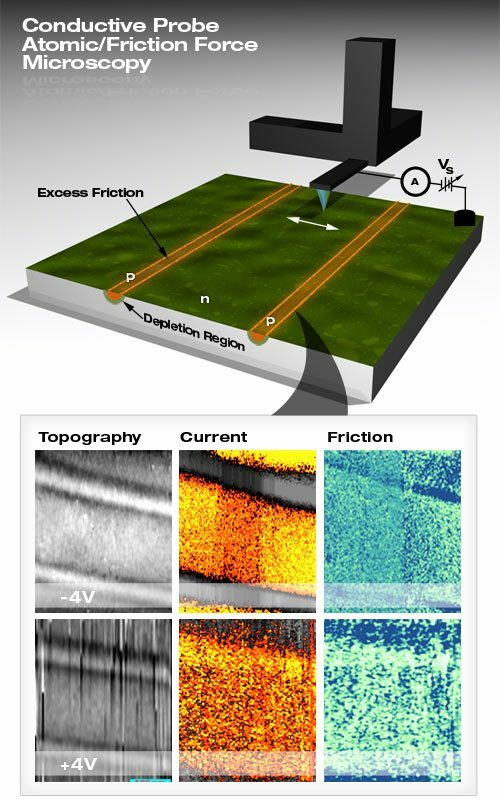 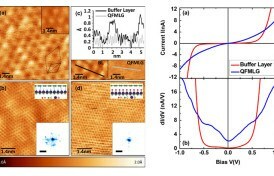 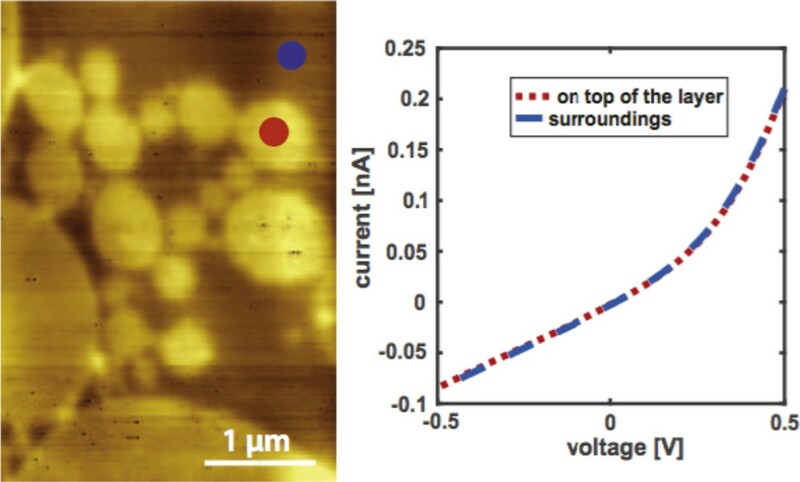 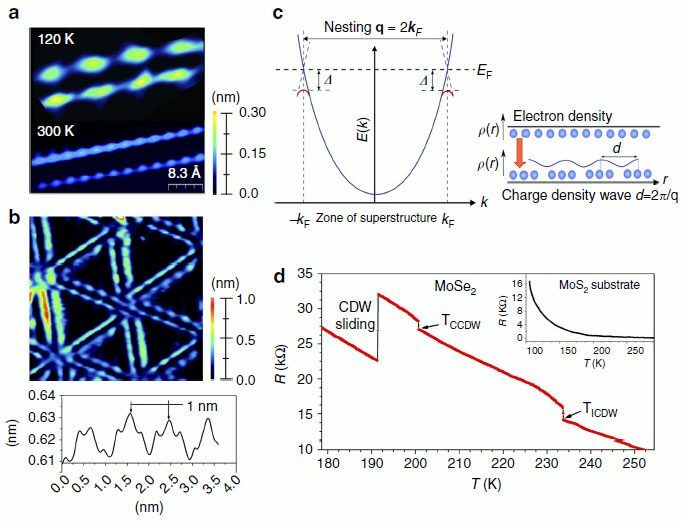 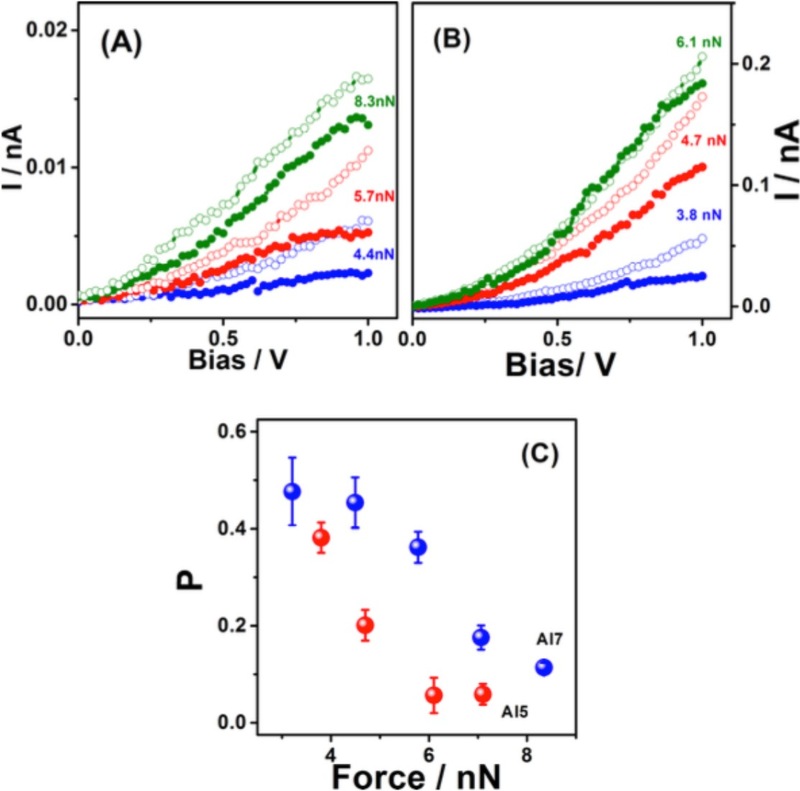 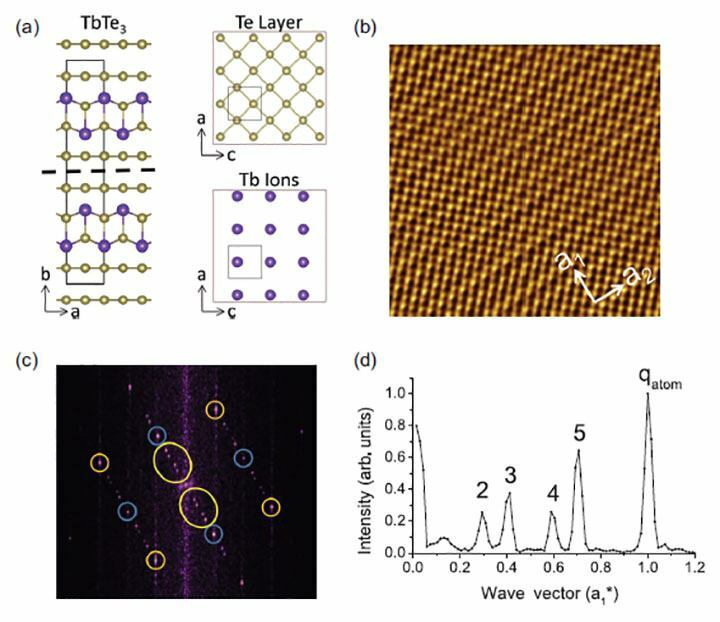 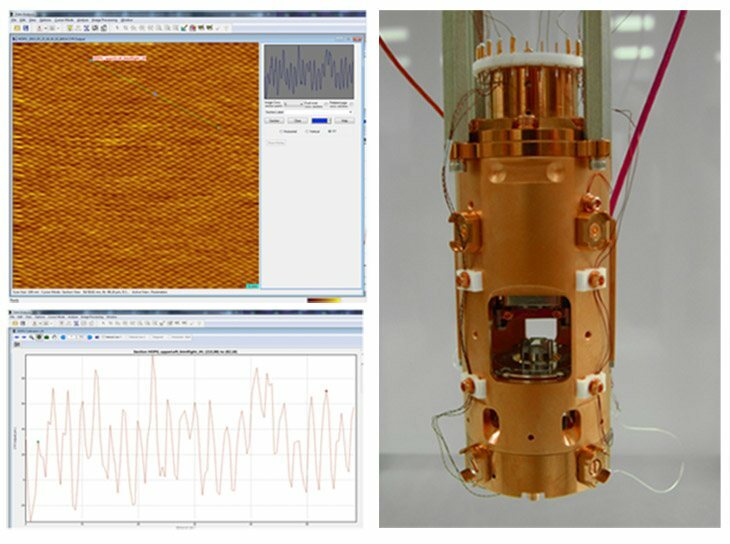 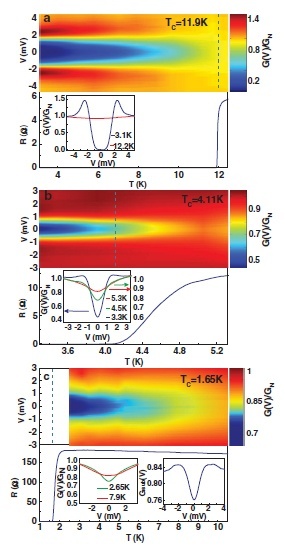 X-ray photoelectron spectroscopy measurements demonstrate the metal−ligand redox activity and are paired with molecular-resolution scanning probe microscopy to elucidate the structure of the metal−organic network. 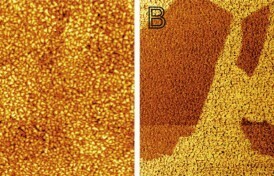 Comparison to the redox-inactive diphenyl tetrazine ligand as a control experiment illustrates that the redox activity and molecular-level ordering at the surface rely on two key elements of the metal complexes: (i) bidentate binding sites providing a suitable square-planar coordination geometry when paired around each Pt, and (ii) redox-active functional groups to enable charge transfer to a well-defined Pt(II) oxidation state. 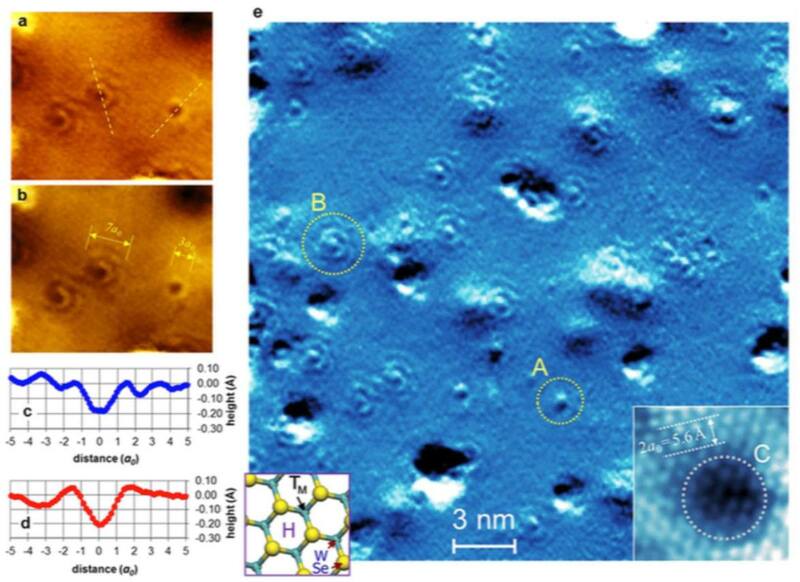 Ligand-mediated control over the oxidation state and structure of single-site metal centers that are in contact with a metal surface may enable advances in higher selectivity for next generation heterogeneous catalysts.